Urged on by a voice no one else could hear, Ray Kinsella, played by Kevin Costner in the movie Field of Dreams, cleared a few acres of corn to build a baseball field. Shortly after, magical things began to happen. When you first set eyes on the headquarters of contract research organization Quality Assistance S.A. outside the tiny Belgian village of Donstiennes, you can’t help but draw a comparison to the movie. As implausible as it may seem to find a CRO amid hundreds of acres of rapeseed, it is a testament to the vision and hard work of its 150 employees that from such fertile soil has sprung one of Europe’s leading providers of contract research services. The seed of this enterprise was planted in 1982 by current CEO, Phillippe Draux and Scientific Director, Phillippe De Raeve. Their firm has since earned a reputation for the quality of the work they do for clients all over Europe. With an eye on the future and the growing needs of their clients, Quality Assistance is breaking new ground in terms of its technological capability and scientific chops. Backed by technology and scientific know-how, they offer more services than comparably sized CROs to take on the challenges that complex molecules present. During a visit to their headquarters, we caught up with three members of their enterprising R&D team: Gery van Vincht, Ph.D, Director of R&D Strategy and Innovation; Arnaud Delobel, Ph.D., Director of R&D; and Eric Largy, Ph.D., R&D Scientist. Together, they work on state-of-the-art analytical method development, transfer and validation for clients with antibody drug conjugates, small molecule cytotoxics and monoclonal antibodies in the drug development pipeline. Quality Assistance has set a goal of assisting 500 innovative drug molecules through development by 2020. To do so, it requires continuous deployment of cutting-edge technologies, particularly for biologics, which have increased to roughly half of its business. 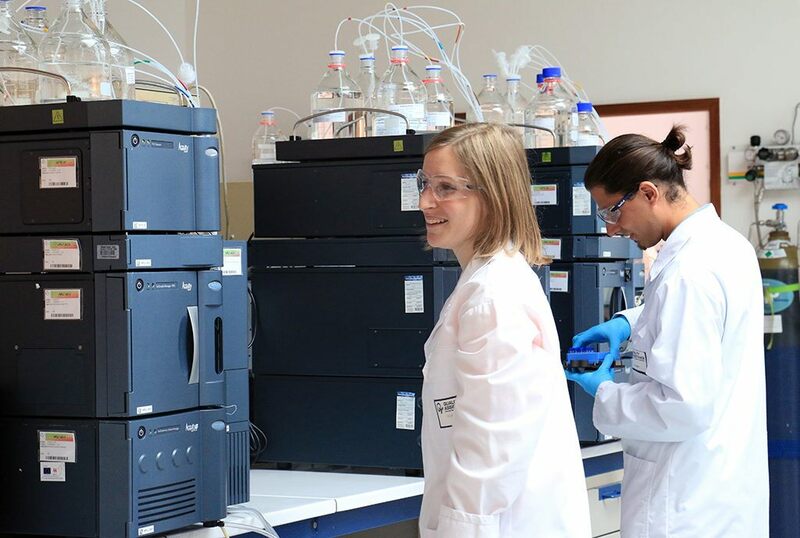 The CRO has deployed compliant-ready Waters Biopharmaceutical Platform Solution with UNIFI to help them to perform high-resolution UPLC-QTof MS analyses – intact protein, peptide mapping, and released glycan analysis – for the characterization and monitoring of biopharmaceutical product quality attributes. Watch what they had to say about the qualities that makes Quality Assistance tres unique. Download the case study to learn how Waters’ compliant-ready biopharmaceutical technologies strengthen Quality Assistance’s confidence in results and ease reporting needs. About the Waters Biopharmaceutical Platform Solution with UNIFI. Quality Assistance has published several application notes on how they use Waters high resolution mass spectrometry systems (HRMS) to characterise biotherapeutics. See their work, under Scientific data.